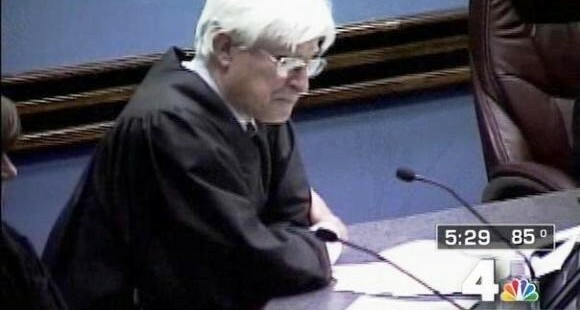 Maryland Circuit Court Judge Robert Nalley was sentenced Thursday to pay a $5,000 fine for ordering a defendant to be shocked in court in 2014, which was caught on a dramatic court video. The Baltimore Post-Examiner broke the story August 2014, but was denied access to the video that was released Thursday. The Post-Examiner initially filed an open record’s request in August 2014 to get the video to be released while Black Lives Matter protest was gaining ground nationally. But the Sheriff’s office denied the request, saying it wouldn’t serve the public interest. When the Post-Examiner refiled again a month later, officials could no longer could find the video. It apparently showed up during the sentencing. Nalley — who in 2009 deflated the tire of a Toyota parked outside the Charles County courthouse – ordered a court security officer to administer an electrical shock to a defendant inside his courtroom on July 23, 2014. On Nalley’s order the Charles County Sheriff’s Department officer pushed a button that administered an electric shock to Delvon L. King, 27, of Waldorf. King, who is not a lawyer, represented himself against gun charges. The video shows that King did not threaten Nalley or anyone else, and did not attempt to flee. The State Public Defender’s office declined to comment about the sentencing, but issued a strong demand when the incident happened, asking the Maryland Court of Appeals to boot him from the bench. The higher court did just that a month after the incident broke in the Post-Examiner. The transcript obtained by the Post-Examiner detailed the conversation. The video corroborates the Post-Examiner’s initial story. “Stop,” Nalley said, according to the transcript. “… principles of common right and common reason are …” King said. “… null and void,” King continued.